Radius Retreat is a forested mountainside retreat offering hike in Yurt experiences. Radius is located in the shadows of the Brisco Range, and has incredible views of The Purcells, with almost 1000 acres of forested wilderness to explore. The extensive trail system is open to all our guests to explore in the summer and winter for hiking, biking, snowshoeing and skiing. Radius backs onto Kootenay National Park, extending the back country nature experience. Only minutes from the Village of Radium Hot Springs, the main gate is located on Hwy 95 and is accessed only by registered guests. It is just a short drive through the gates up to the main parking area, where your Hike-In Yurt experience will begin at The Trailhead. Radius Retreat is a unique Yurt accommodation in the Columbia Valley, and it is an off grid, sustainable wilderness area. Radius has composting vermiculture toilets and they do their very best to be caretakers of the land – allowing no motorized vehicles, hunting or building that would impact the land or the critters within it. There is solar power lighting in each Yurt, custom built wood beds with super comfy mattresses, table and chairs, a wood burning stove, as well as outdoor furniture, a cooking stove and campfire pit, with firewood provided for your stay. And dogs are always welcome at Radius. The Yurts are anywhere from an easy 2 minute walk, to a 2.5 km moderate hike up the mountain. 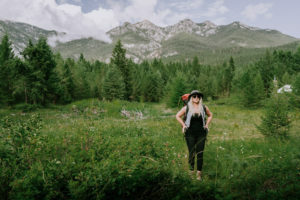 Each Yurt location has been chosen for it’s connection to the land, and each one has it’s own vibe that will immerse you into the surrounding natural area. 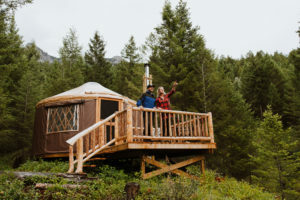 When you get to your Yurt, you will feel like you have arrived to a remote place of natural beauty and peace, away from civilization, and yet you are only a few minutes from town and all the amenities it offers. You will feel like you have entered a whole new world of fresh air, solitude, peace and serenity with Radius Retreat.